On my way to breakfast at Bottega Louie, I had to make a pit stop at MacArthur Park. Artist Ed Massey has an amazing art installation on display. 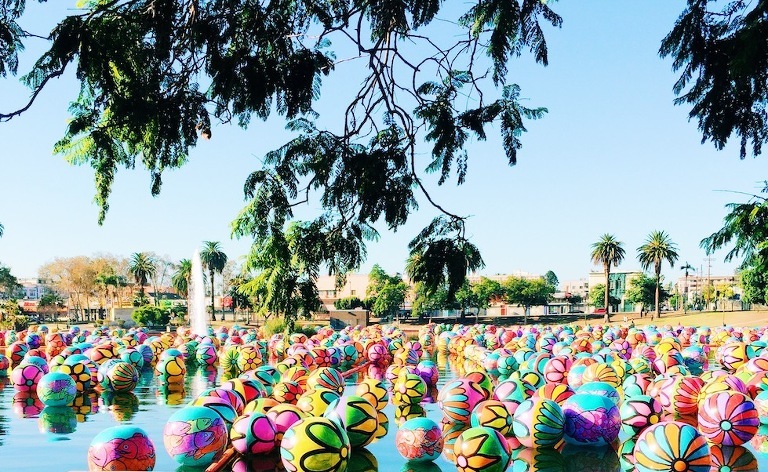 There in the center of the park, are thousands of large colorful spheres floating in the lake! Artist Ed Massey and his nonprofit Portraits Of Hope brought this colorful installation to life along with a team of volunteers. I’ve been a fan of Ed Massey for years and love the colorful art projects he’s created for Portraits Of Hope. It was great to be able to finally see one of his projects in person and totally worth my small detour. I really enjoyed visiting the installation early in the morning since the park was mostly empty and I could avoid traffic and other visitors. It also allowed me a quiet moment before starting my busy day. If you’re in the area I’d definitely take the time to stop and enjoy the colorful installation.